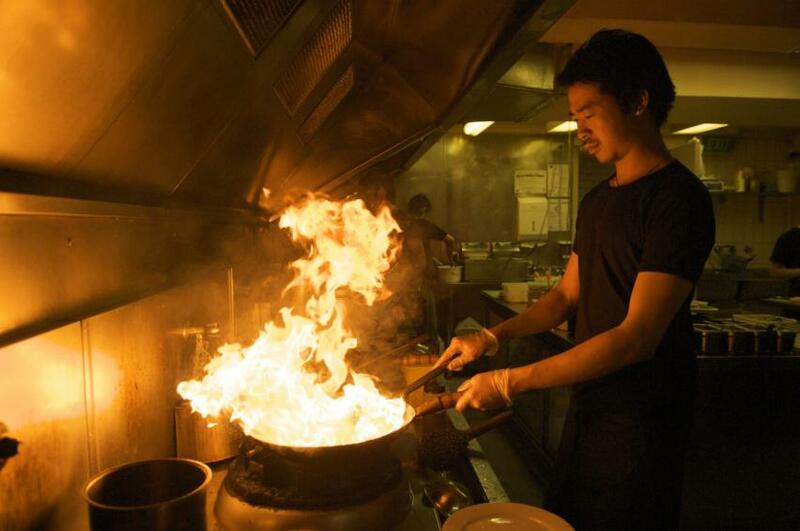 Mamak chef definitely handling the heat in the kitchen (photo courtesy of Mamak). It is no great secret. The perfect meal to accompany a few beers is a curry. Problem is, when a few beers turns into a few too many, I tend to not only seek out a curry but order the entire menu only to fall in a heap at the end of the meal searching for my bed. On a night out (leading on from an afternoon out) recently with a mate and his fiancée, we reached that all too familiar time of the night where the call of a spicy curry was ringing in everyone’s ears. We spent a sunny summer afternoon on Cockatoo Island in the middle of Sydney harbour sipping beers and mojitos while enjoying what is possibly one of the most spectacular views a major city has to offer. As the last ferry approached, the call was made to make a b-line for Chinatown for something to eat. Arriving in Chinatown amid the hustle and bustle of hundreds of hungry party goers and humans alike we wondered upon the famous and ever popular Mamak. Of course we had all heard of the food that Mamak is famous for, but it was the Roti man in the front window working his magic that sealed the deal (remember we had been drinking all afternoon and night). Mamak is open until 2am on the weekends and the place is on everyone’s late night radar with the line up constantly 10-20 people deep at any given time. Mamak line up (photo courtesy of Mamak). After a short wait, we were seated in the middle of the restaurant where we could experience the pace and hustle of the wait staff and where we could still see the Roti man do his thing. Sitting back with a beer and reading the menu, I was happy. The smell of spice and coconut curry had filled my nose and I knew that my time had come. Without much deliberation, we ordered the Roti Canai and a dozen satay chicken skewers to start, Sambal Udang (Tiger Prawns in a sambal sauce), Kari Kambing (slow cooked lamb curry) and the Ayam Goreng. First up was the Roti. It was everything I had salivated about as I watched the Roti man knead, spin and cook his craft through the front window only minutes prior. Everything we ordered was cooked to perfection and took me back to a happy time in my life when I was cruising around South East Asia with nothing to do but enjoy life. The highlight and at the same time the low light for me was the Prawn Sambal. The flavour was immense. The sweet and sour of the sugar mixed with the white vinegar combined perfectly with the plentiful chilli and lime juice to offer what can only be described as a gastronomic fireball in the mouth. I experienced something similar in Thailand years ago where I found a man who sold green curry that was so amazingly delicious that I couldn’t stop eating it despite the fact that it was swiftly stripping my mouth of its nerve endings due to the chilli. In between patting my face down with a napkin, I promptly asked the waitress for an Iced Milo (chocolate milk). While reading the menu previously, I spotted the Iced Milo and wondered why on earth they would offer such a thing…now it was glaringly obvious. 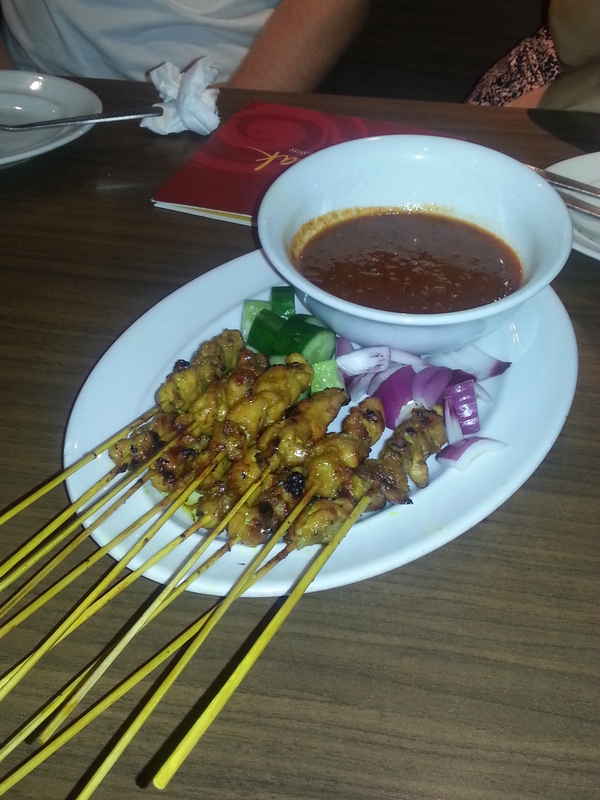 Satay chicken skewers – I could have eaten a dozen on my own! When the meal concluded, we all sat back, hands on stomachs, taking regular sips of iced water. We were happy. It was hot and not the most relaxed or comfortable meal we had ever eaten but we were happy. This restaurant serves quick food and this might not suit everyone, but if you ever find yourself wondering through Chinatown after a few beers, looking for something to eat then do yourself a favour and head to Mamak. You wont have trouble finding it. It is the place on the corner of Goulbourn and Dixon streets with the line up out the front and the Roti man entertaining people in the front window. Mamak is an authentic, reasonably priced and fast paced delight, whether you are eating it after a few beers or not. 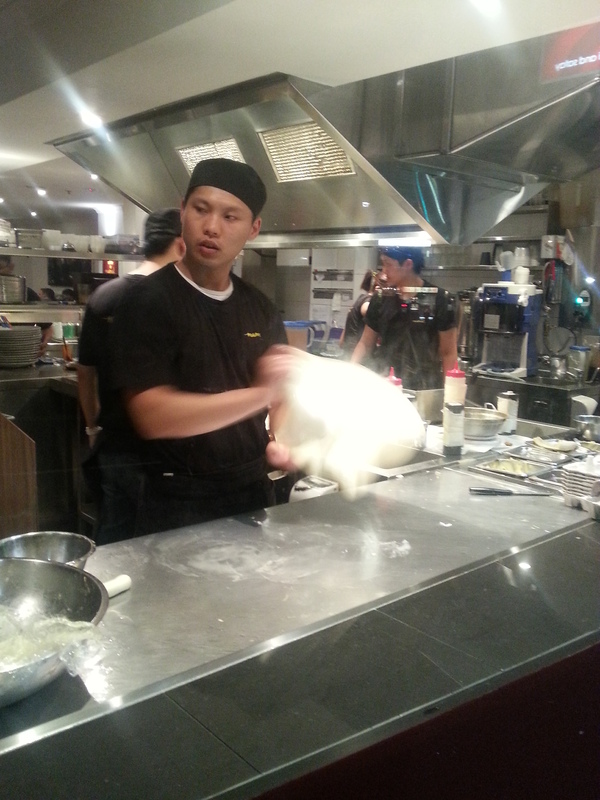 Roti man doing his thing and keeping those in the line entertained. 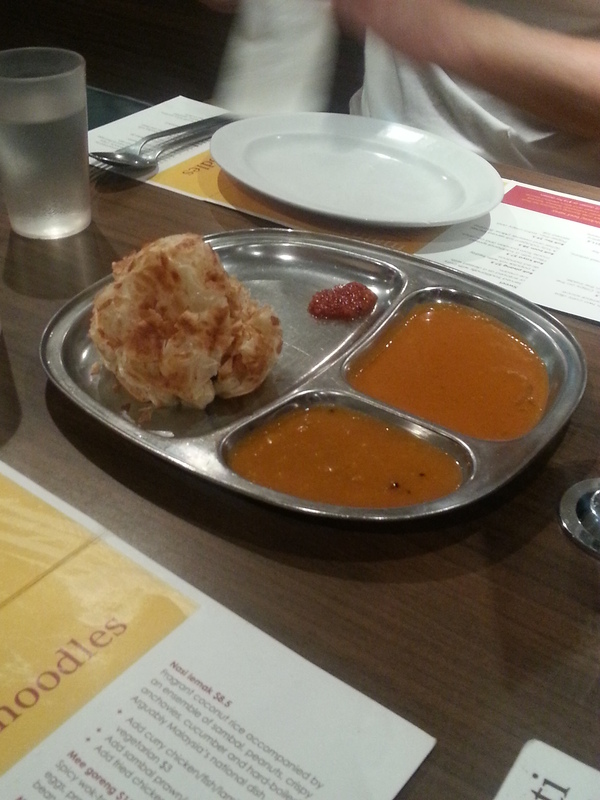 Roti with curry sauce and spicy sambal. 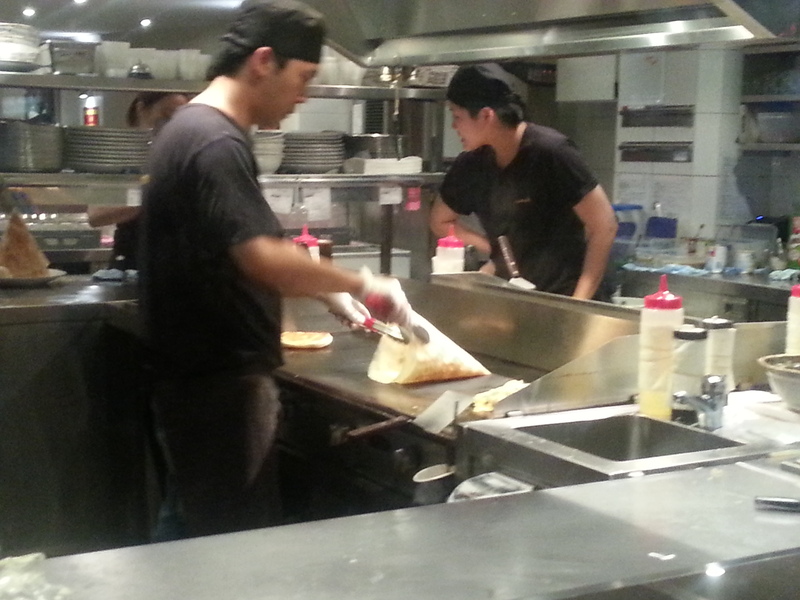 The Roti grill was getting a workout! 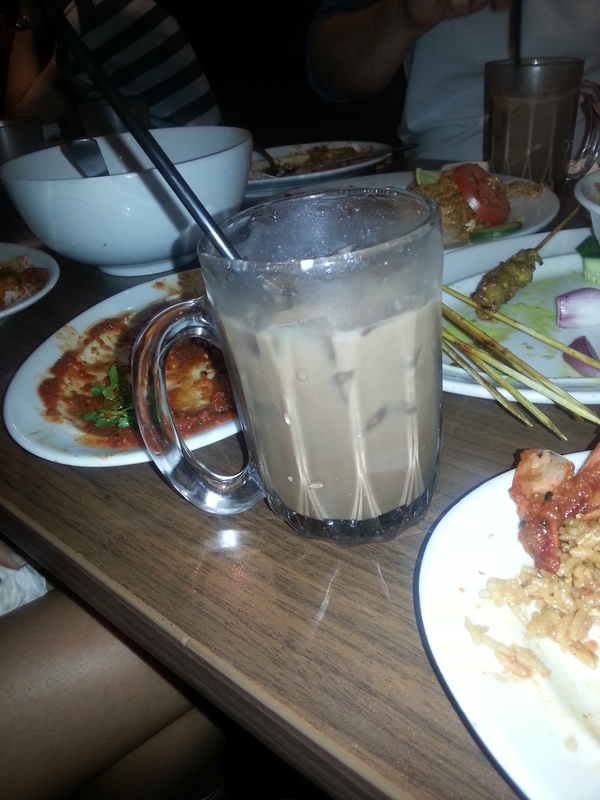 My saviour, the Iced Milo among empty plates.